Matt’s litigation practice is focused on guiding hospitals and health care practitioners through medical malpractice and other health care related litigation. 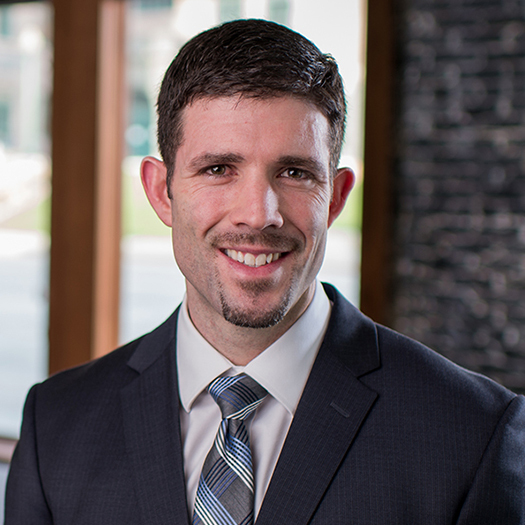 Additionally, Matt has experience litigating in the areas of employment law, construction law, premises liability, general insurance defense, commercial litigation, and in representing plaintiffs in their personal injury claims. Matt practices in both the state and federal courts of South Dakota. Matt has obtained favorable jury verdicts for his clients, he has had consistent success in court trials and in motion practice, and he has efficiently and effectively resolved countless other disputes. Matt grew up in Rapid City, South Dakota and then attended the University of South Dakota for both undergraduate studies and law school. During his undergraduate time, he played football for the University and was named Academic All-American (Second Team). In law school, he was involved in various organizations, including trial team, and he graduated with Sterling Honors (top 10% of class). Representing individuals injured in auto accident and other personal injury disputes. • 2018 (jury) – Obtained a defense verdict for a local golf course in a premises liability slip and fall case. * Daniel McAllister v. City of Brandon, Second Judicial Circuit, State of South Dakota, Civ. No. 16-3137. • 2016 (jury) – Obtained a defense verdict for a pediatric gastroenterologist in a medical malpractice trial wherein the plaintiff asked for over $5 million in damages. * Basil O’Day and Tracy McClure, as Guardian ad Litem for N.W.O. v. Stephen Nanton, M.D., Second Judicial Circuit, State of South Dakota, Civ. No. 12-1717. * Decision affirmed by the South Dakota Supreme Court. O’Day v. Nanton, 2017 S.D. 90, —N.W.2d—-. • 2016 (jury) – Represented a local hospital and its nursing staff in a bariatric surgery and sepsis case, which the plaintiff dismissed three days into trial. * Lakisha M. Brown and Dustin Brown v. The Surgical Institute of South Dakota and Avera McKennan, Second Judicial Circuit, State of South Dakota, Civ. No. 12-3090. • 2015 (jury) – Obtained a defense verdict for a hospital in a wrongful termination trial wherein the plaintiff physician presented a damages model of nearly $6 million in allegedly lost wages. * Dr. Sonia Hernandez, D.O., v. Avera Queen of Peace Hospital (AQOP) & Dr. Joe Krall, First Judicial Circuit, State of South Dakota, Civ. No. 12-268. * Decision affirmed by the South Dakota Supreme Court. Hernandez v. Avera Queen of Peace, 886 N.W.2d 338 (S.D. 2016). • 2014 (jury) – Obtained a directed verdict for a hospital in a premises liability trial. * Cynthia Leonard v. Prairie Lakes Healthcare System, Inc., Third Judicial Circuit, State of South Dakota, Civ. No. 13-0538. • 2013 (jury) – Obtained a Plaintiff’s verdict for an individual and his business, in a breach of contract and defamation trial, of approximately $250,000. * Dudley J. Deffenbaugh, Individually and Deffenbaugh Construction Inc., d/b/a Deffenbaugh Homes v. Janeen Steffen, Second Judicial Circuit, State of South Dakota, Civ. No. 12-2477. • 2015 (court) – Obtained a favorable result for a local municipality in a property dispute. * Cory Baker and Donal Gohman v. City of Brandon, Second Judicial Circuit, State of South Dakota, Civ. No. 14-458. • 2014 (court) – Obtained a favorable result for a hospital in a property dispute. * Avera McKennan v. Brady Spurlin, Second Judicial Circuit, State of South Dakota, Civ. No. 14-1689. • 2017 – Obtained summary judgment in favor of a national truck stop chain in a motor vehicle accident case. The judgment was summarily affirmed by the S.D. Supreme Court. * Alfreda Siems v. Pilot Travel Centers, LLC, Second Judicial Circuit, State of South Dakota, Civ. No. 14-1067 (April 18, 2017), summarily aff’d, S.D. Sup. Ct., Appeal No. 28254 (Nov. 13, 2017). • 2016 – On behalf of a hospital, successfully appealed and overturned a trial court’s discovery decision undermining the medical peer review protection in South Dakota. * Novotny v. Sacred Heart Health Services, et al, 2016 SD 75, 887 N.W.2d 83. • 2016 – Obtained summary judgment in favor of a city in a wrongful termination case. * Griffith v. City of Watertown, 2016 WL 4275635 (D.S.D. August 12, 2016). • 2016 – Obtained summary judgment in favor of a county and county official in a §1983 and wrongful termination case. * Nicole Knisley v. Lake County et al, 2016 WL 1464553 (D.S.D. April 12, 2016). • 2015 – Obtained summary judgment in favor of a siding subcontractor being sued for design and/or installation defects, said judgment later being affirmed by the S.D. Supreme Court. * Gades v. Meyer Modernizing Co., Inc., 2015 SD 42, 865 N.W.2d 155. • 2013 – Obtained summary judgment in favor of a South Dakota county, dismissing a plaintiff’s personal injury claim premised upon an alleged defect in one of the county’s highways. * Cindy Kuemper v. Hamlin County et al, Third Judicial Circuit, State of South Dakota, Civ. No. 12-23 (October 11, 2013). • Leggins v. Eggert, 2014 WL 1285786 (D.S.D. March 27, 2014). • Christine C. Gould v. Avera McKennan Hospital et al, Second Judicial Circuit Court, State of South Dakota, Civ. No. 13-2424 (April 1, 2014). • McKennan Hospital et al, 2016 WL 1117441 (D.S.D. March 21, 2016). * Sheris Red Feather et al v. Lutheran Social Services of South Dakota et al, Fourth Judicial Circuit, State of South Dakota, Civ. No. 11-734 (September 12, 2012). • Other searchable opinions include: Mittleider v. Dakota, Minnesota, Eastern R.R., 2014 WL 1093812 (D.S.D. March 19, 2014) and 2012 WL 1231939 (D.S.D. April 12, 2012) (representing the plaintiff in a breach of employment contract suit against the DM&E and Canadian Pacific Railroad); Anspach vs. United of Omaha Life Ins. Co., 2013 WL 842450 (D.S.D. March 6, 2013) (representing a life insurer in a bad faith lawsuit).